We arrived from Hoi An at about 8am after another bad bus journey. The bus was really full so there was not much room and the seats were really close together even I was squashed! The temperature was also at the other extreme to the Hanoi bus , it was so hot there was no airconditioning and no fresh air. At one stage I even led on the dirty floor to try and get some sleep, but it didn't work. Behind us on the back seat a was a Canadian girl and an American guy, they had just met and he poceeded to tell her his life story for about 4 hours, she couldn't get a word in edgeways! In Nha Trang we were dropped in the centre, but it took us about 2 hours to find a hotel, I think we were both being fussy and in the end we ended up in a nice room, but it was overpriced - we were fed up of looking. After a nap we had to go and pick up our replacement travellers cheques, we decided to walk and went totally out of our way, but we got them and it was a fairly painless process. We stopped for a pizza and a salad and bumped into the Canadian girl from the bus Elisa Lea. We arranged to meet that evening for a free BBQ and drink at one of the bars. Before we went back to the hotel we wanted to check out the beach it was just getting dark but it was still busy. We walked along the sand and decided to stop for a drink at the Sailing Club. 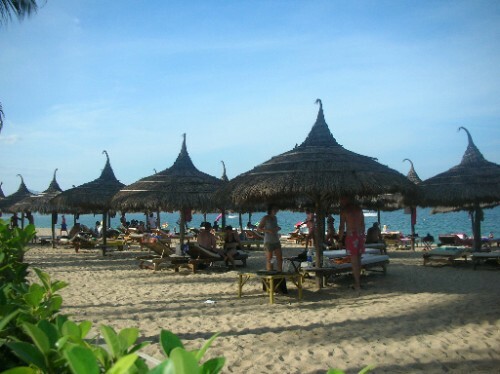 This is a large bar on the beach, there is also a small beach bar where you can get a drink in the day and hire a sun lounger. The bar was really nice and when we left we realised it had two restaurants an Italian and an Indian. We met Elisa Lea on the Read Apple cafe, where they sold buckets of cocktails so we indulged, there was also free shots being handed out as well as a BBQ buffet with kebabs, salad and small jacket potatos. I spotted a couple of guys who were on our DMZ tour and Elisa Lea had met them in Ha Long Bay. Instead of leaving we joined them for a couple of drinks and a game of Jenga. This is the first night we have been drunk so far, how rubbish are we!!? The next day we had a late breakfast, I had a toasted sandwich and wayne had egg, chips and beans - all very Vietnamese! We then headed down to the beach, we walked past the sailing club and found some 2 empty sunloungers outside a place called La Louisianna, this is a bar and restaurant that own the sun loungers and they also have a pool by their bar for customers to use. We sat on the beach and enjoyed the sunshine, the sea was also lovely and there was a strong BBQ smell, local ladies were cooking lobster, crab and prawns to order on the beach. We stayed on the beach until late afternoon, by then it had clouded over so we headed to the bar for a quick drink. La Louisianna is a brew house so Wayne tried one of their own beers a ginger ale. We got twalking to an Australian guy from Adelaide about his time in Vetnam and he also gave us some tis for OZ. For tea we found a Vietnamese restaurant just by our hotel, it looked really nice from the outside, but the food was really bland and a bit pricey, we were both disappointed. The next day we got up and moved to a hotel a couple of doors down, it was $12 and was not much different from the one we had just left. We then had a quick breakfast and headed back to La Louisianna. We had a milkshake and sat around the pool, Wayne jusmped in to cool off. There were no free sun loungers on the beach or by the pool so we just sat at the table until about 1 hour later a couple left the pool area, we jumped into their place! It was a lovely sunny day but it wasn't too hot and the atmosphere was really relaxing. Wayne found that they also did massages, manicures and pedicures. Wayne had an hour body massage for %uFFFD3.00 and I had a pedicaure for %uFFFD1.50, both relaxing. We then decided to have a snack and we shared a salad, while we were having this the waiters were bringing out more tables and setting up a function. This turned out to be a wedding. We stayed on our sun loungers into the evening, while the wedding was getting underway they had a band on the pool terrace and then we heard the wedding song, Wonderful Tonight by Eric Clapton sung by a Vietnamese guy. All very funny! We got back to our hotel and grabbed the laptop and wen in search of a WIFI cafe, which was easy to find. We sat outside and ordered, the food was quite good, but it was really noisy and we were unable to chat on the laptop. We went upstairs and it ended up with a small Vietnamese girl called Shelley talking to my Mum and Dad rather than me.